SAIPUA: is it july yet? here is Jenni's wedding bouquet from last weekend. 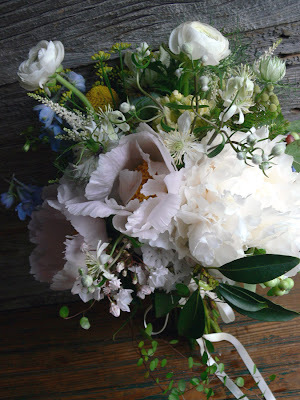 with peonies, mountain laurel, ranunculus, angel vine, delphinium, dill flowers, clematis, etc. this morning I feel very lucky. a little anxious. a little tired. you must be crazy! 6 weddings? And your stuff still looks so gorgeous and intimate. nice work. Thank you so much Sarah! You made my wedding such a very special day! It was such an amazing, beautiful bouquet! !